Then just a toddler, Freeland Knight Abbott hoes ‘Connecticut Wonder’ beans in his family’s garden in 1922. The heirloom bean is one of 12 new ‘From the Collection’ varieties now available from Seed Savers Exchange. You may well know that Seed Savers Exchange maintains an exquisite, unique collection of more than 20,000 vegetable, herb, flower, and fruit varieties amassed since its founding more than 40 years ago. But did you know that each year our Preservation team regenerates, evaluates, and collects the histories and traits of dozens of these varieties as we grow them at Heritage Farm, our northeast Iowa headquarters? This work allows us to identify interesting and high-performing varieties to introduce commercially so that home gardeners everywhere can enjoy them. We are thrilled to introduce the following 12 varieties, available for the first time this December both online and through our 2019 catalog. ‘Williams’ Sorghum: This heirloom syrup sorghum towers over the garden—reaching seven to nine feet—and produces seed heads with beautiful red glumes (and an occasional black glume for added interest). The grain itself is red, plump, and easy to thresh. This variety was donated to Seed Savers Exchange by Wayne Hayes of Annville, Kentucky, in 2015. Wayne and his family have made syrup from this sorghum cane since Wayne’s father, Floyd, purchased it in Louisiana in 1948. Each plant produces from three to six tillers, and, according to Wayne, “one cane or stalk will make six tablespoons of juice, approximately 55 gallons of juice are required to make four gallons of sorghum.” And once made, its uses are varied. Try mixing it with butter and slathering the mixture on a hot biscuit, adding it to baked beans, or using it to make sorghum candy. ‘Hopi Red Dye’ Amaranth: A commanding presence in the garden, this heirloom amaranth grows up to six feet tall and offers a showy display of dark purple-green leaves, solid purple stems, and draping deep purple-red inflorescences. Used for dye or as an ornamental, it was given to Seed Savers Exchange by Native Seeds/SEARCH, which notes that this variety was collected in the lower area of Moenkopi, Arizona. The Hopi people make a natural scarlet food dye from the flower bracts to color piki bread. It flowers (spectacularly!) in mid-to-late-June at our Heritage Farm headquarters in northeast Iowa. 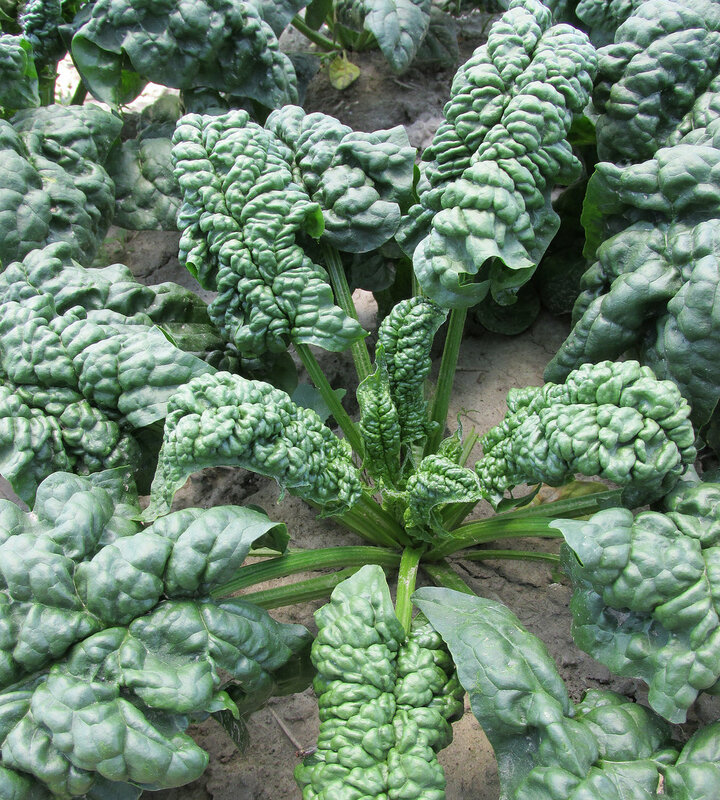 ‘Norfolk’ Spinach: (coming soon!) Prized for its excellent taste, this historic variety has traveled from gardener to gardener for decades. Seed Savers Exchange acquired it from the Abundant Life Seed Foundation in the 1980s; the foundation obtained its seed stock in the 1970s from grower and SSE member Peter Ruppell. Believed to be the same variety sold by the Peter Henderson seed company as early as 1878, it grows semi-upright plants reaching 10" tall and 2" wide and bear dark-green, savoyed leaves that are heart-shaped with long petioles. The variety resists bolting when sown in the spring but may grow larger when planted in the fall. ‘Tony Scavo’ Basil: This intensely flavored, aromatic basil will produce well if harvested regularly. The leaves have prominent veins and serrated edges and grow to about 15" tall. Gale Morris of Iowa donated the variety to Seed Savers Exchange in 2014. Gale received the seeds from his friend, Des Moines truck farmer Tony Scavo, in 1993 and began growing the variety and saving its seeds for Tony as Tony’s eyesight worsened. Tony's parents, Nick and Patricia, brought this heirloom to the United States when they emigrated from Bari, Italy, in the early 1900s. ‘Whittemore Heirloom’ Tomato: Considered one of the best-tasting tomatoes by Seed Savers Exchange staff, this variety offers complex and well-balanced flavor. The impressively large pink beefsteak tomatoes have large lobes and deep ribbing. Some fruits may have moderate cracking, but they are remarkably blemish-free with respect to their size—a whopping 1½-2 pounds in weight and nearly 5-6" in width. Edley Bellamy of Virginia donated this seed to SSE; Bellamy received the variety from Oscar Gibson in 1993. ‘Connecticut Wonder’ Bean: Mother (Nature) knew best when it came to this beloved family heirloom. The original steward, Reverend Frank Abbott, told his granddaughter, Deborah, that the beans were a “gift from the bees”—a result of cross-pollinated plants in his Bolton, Connecticut, garden, sometime prior to 1919. He named the new variety ‘Connecticut Wonder’ and believed it was a cross between ‘Kentucky Wax’ and ‘Cranberry Pole’ beans. In the mid-1970s, Deborah gave the seeds to John Withee, who donated them to Seed Savers Exchange in 1981. The pods are sweet, juicy, and slightly stringy. The strong climber grows white flowers and green pods that mature to pale yellow and contain large, shiny, dark-brown, kidney-shaped seeds. ‘Student’ Parsnip: (coming soon!) The slightly sweet and shapely roots of this historic variety make it ideal for adding to your roasted vegetable mix. Its straight roots bear wide shoulders, a fairly acute taper, and smooth skin with little to no splitting. The variety was included in the 1865 edition of Fearing Burr’s classic tome Field and Garden Vegetables of America. Burr described it as “so recently brought to notice and so strongly commended, is of English origin, and was obtained from the wild Parsnip by Professor Buckman, of the Royal Agricultural College at Cirencester.” This variety, acquired by Seed Savers Exchange from member Dennis Sherwood, is a deserving addition to any garden. ‘Feaster Family Heirloom’ Mustard: This heirloom variety has been grown and preserved by members of the Feaster family of rural Shiloh, Florida (Marion County), since the Civil War. Mild and slightly sweet when cooked, the green-leaved mustard was donated to Seed Savers Exchange by Jerome Feaster in 2014. 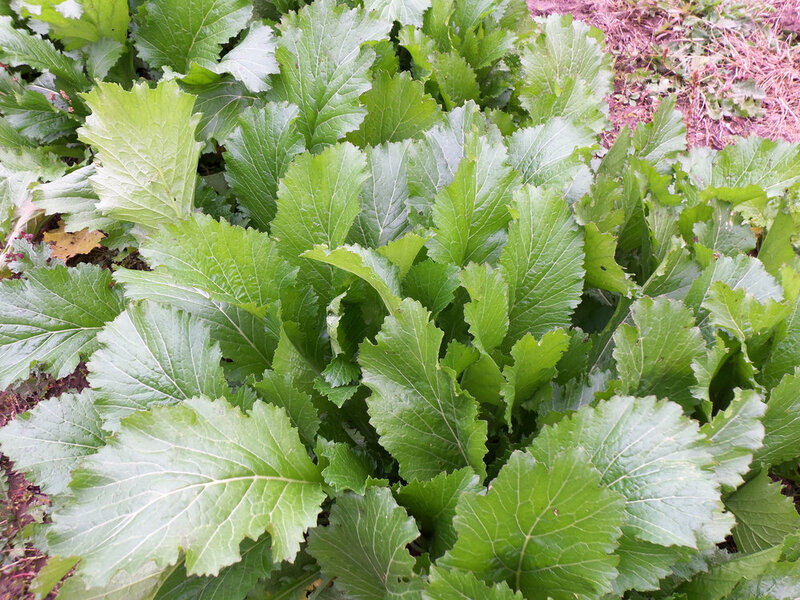 Bearing long, broad, smooth, upright leaves with a toothed margin, the mustard plants reach 20-25" tall and 16-18" wide. Jerome has stewarded the variety since his mother, Gladys Abraham Feaster, died in 1989. ‘Agostino Reghitto’ Genovese Basil: A classic Genovese-type basil, with dense foliage, this herb has a slightly milder anise profile. It comes from the family of Steve Foisie and is named for his grandfather, Agostino Reghitto. Agostino emigrated from Italy to Washington State in 1902 and founded Colonial Gardens Company, which raised vegetables for the Tacoma and Olympia markets. It’s unknown if the basil came from Italy, but Steve and his sister, Sue, recall that their mother, Della (Agostino's daughter), grew it each year. It was donated to Seed Savers Exchange by the late Mary Schultz, a former SSE member who received it from the Foisie family in response to her search for heirloom seeds to help celebrate the centennial of Washington’s statehood in 1989. The upright plants measure approximately 1' tall, and its leaves measure about 3-4½" long and about 1-2" wide. ‘Kelvedon Marvel’ Runner Bean: Producing crunchy, sweet, and fruity snap beans with an apple-grape flavor, this runner bean might just unseat your favorite snap bean. In addition to tasting great fresh, the variety produces dry beans with a slightly sweet, earthy flavor and a smooth texture. A strong climber with beautiful flowers, the variety was developed by W. Deal and Sons of Kelvedon, Essex, England; introduced in 1950; and given to Seed Savers Exchange in 1981 by famed bean collector John Withee. Rarely available in the United States commercial seed trade, it is a marvel to be enjoyed in the garden and on the table. ‘Gill’s Golden Pippin’ Squash: This flavorful acorn squash may be among the first to show up on your table each fall. The fruits of this historic variety produce flesh that is pale orange in color, moderately sweet in flavor, and a bit variable in shape. Its vining plants are quite productive and yield relatively early-maturing fruits that measure 4-5" long and 3½-4" wide, and weigh 1-1 ½ pounds. Gill Brothers introduced the variety in 1952. When you purchase seeds from Seed Savers Exchange, you are giving rare varieties (including these 12 new ‘From the Collection’ varieties!) a place in your garden and at your table even as you support our work to ensure that the biodiversity of our food system remains intact for generations to come.